In the church we like to talk about a year supply of this or that. 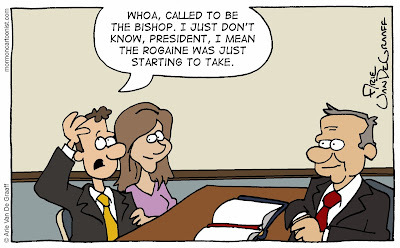 Bishops need a five-year supply of Rogaine® and Just for Men®. Rogaine is just scratching the surface of all the medications our poor, overworked bishops need. I'll make a list if you'd like. That's why it's so nice to have a doctor or two (or four) in the family. I can over-medicate for everything! Almost 2 years ago, our then Bishop was called to be Stake President. This led to much speculation about his new title - he thought 'Bishident' would work but I favoured 'Presihop'... the matter was solved with the unusual sight of a President releasing himself from a calling. That bishop and his wife look way too familiar. Come on, Kelsey, my hair hasn't thinned that much, has it?